The LiCor Odyssey 9120 Infrared Imaging System delivers accurate and reproducible results with Western Blot and more. The consistent digital images produced by the imager cut out the hassle of film, while providing clear Near Infrared results. The Licor Odyssey 9120 Infrared Imaging System eliminates the guesswork and background fluorescence, allowing for the sharpest digital results needed to make your assays reproducible. The LiCor scanner uses direct infrared fluorescence detection to count low plentiful proteins need for Western Blot applications. Imaging system plugs directly into a 115v outlet and runs on less than 9 amps. The Li-Cor Odyssey Classic Imager includes two solid-state lasers a 685nm and 785nm that work together to bring a resolution of 21-337µm. The system comes with built-in slicon avalanche photodiode detectors and has a scanning speed of 5-40cm per second. The scan bed is movable in the Z-Dimension, which allows the Li-Cor Odyssey fluorescence detection microscope to align at the top of the surface of imaging glass to obtain the best signal-to-noise ration. This infrared imager plugs into a standard 120V outlet and operates on less than 2Amps. Each laser has a shelf-life of 40,000 working hours. The Li-Cor Odyssey Classic is network configured with a standard RJ-45 communication connection in the rear of the scanner. System includes a Windows 7 notebook running Imaging Software and has been calibrated to factory specification. The Li-Cor Odyssey comes with built-in scan features such as near-infrared fluorescence, two color detection, quantification, exact measurements for weak and strong singals, along with a wide linear range scan. The Li-Cor Odyssey comes with a built-in 80GB hard-drive and can store your runs safely within the Imager. 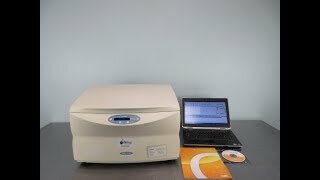 This system is ideal for low count plentiful proteins, tissue section analysis, protein assays, in-vivo imaging, Coomassie gel documentation, Western Blot and gel documentation. Now you can run a Western Blot assay with the need for any film, or a darkroom. All of our Li-Cor Imaging systems comes fully tested and calibrated. Our technician's check for laser strength and cooling module to ensure they're in good working condition. Contact us about our Li-Cor Odyssey 9120 Imaging System. 15" x 22" x 25"
This LiCor Odyssey 9120 Infrared Imaging System is still in the original box, has thoroughly inspected and is in great condition. All of our lab equipment comes backed with our standard warranty. Should you have any questions, please let us know, we're happy to answer them.